This PDF guide, produced by Simon Barnett, gives details of what you can see in the night sky over Wolverhampton this winter. Simon has produced some amazingly detailed and thorough sky guides for us over the years, but sadly this will be his last one. We are incredibly grateful for all his hard work, and I hope that many of you have found them useful during your observing. My eclipse trip started at Heathrow on the 18th August. At 6am that morning there was a beautiful clear sky that presented a thin crescent waning moon by Venus, (my camera was packed away, so I didn’t get a photo). With only three days to go before the eclipse, as I watched the moon rise outside the airport I pondered on how the crescent would get even thinner over the next few days, till the moon would seemingly vanish from the sky and be completely ‘backlit’. 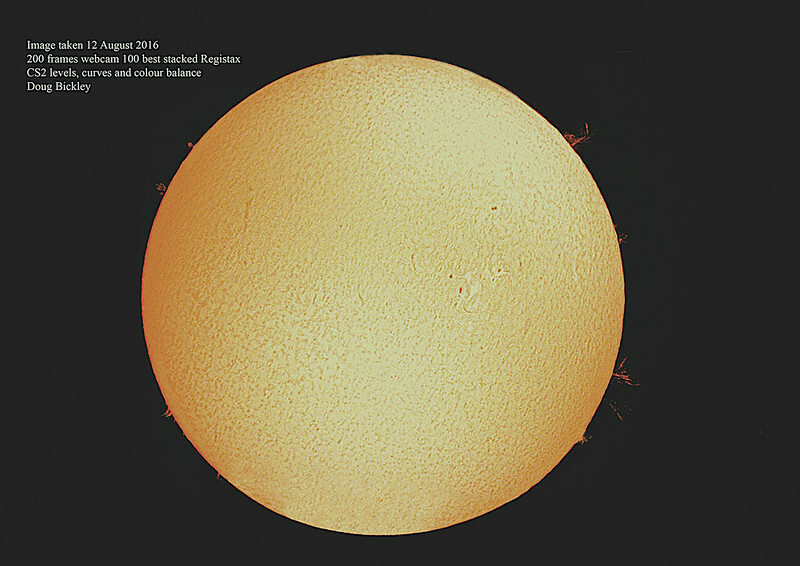 It does this every lunar month of course, but this particular month, the moon’s position in the sky meant that it would move directly in front of the sun at 1.34pm on Monday, and weather permitting, grant us one of the finest astronomical treats. David Harris, who passed away on 1 July this year, is very fondly remembered as a founder member and long-standing supporter of Wolverhampton Astronomical Society. 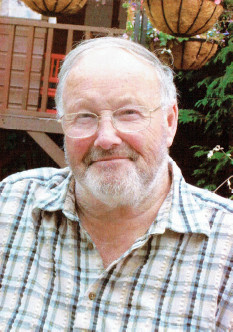 David will be lovingly remembered by his wife Mary, son Christopher and daughter Libby. On 12 July, several members of the Society attended David’s funeral at Bushbury Crematorium and his memorial service held at Beckminster Church. 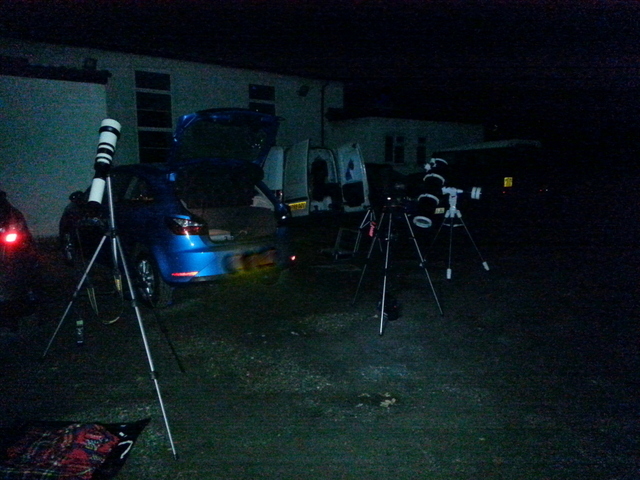 The Society was formed officially in September 1952, from a pre-existing informal group of enthusiasts, initially as the Wolverhampton Amateur Astronomy Group. David would celebrate his 19th birthday in the following month. Meetings were held in a classroom at the old Walsall Street Institute. Even in those early days I recall David giving presentations on practical astronomy, both with telescope and binoculars, which was his forte. One item remembered from that time is a planetarium, shown by David and his father, made by poking holes in the desired places in an opened black umbrella, to represent the constellations. A simple but effective way to teach the geography of the night sky, in a room under artificial light or outside in daylight. 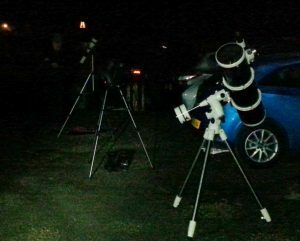 This PDF guide, produced by Simon, gives details of what’s visible in the Wolverhampton night sky this summer, along with details of the moon, the planets, and full details of the upcoming solar eclipse! 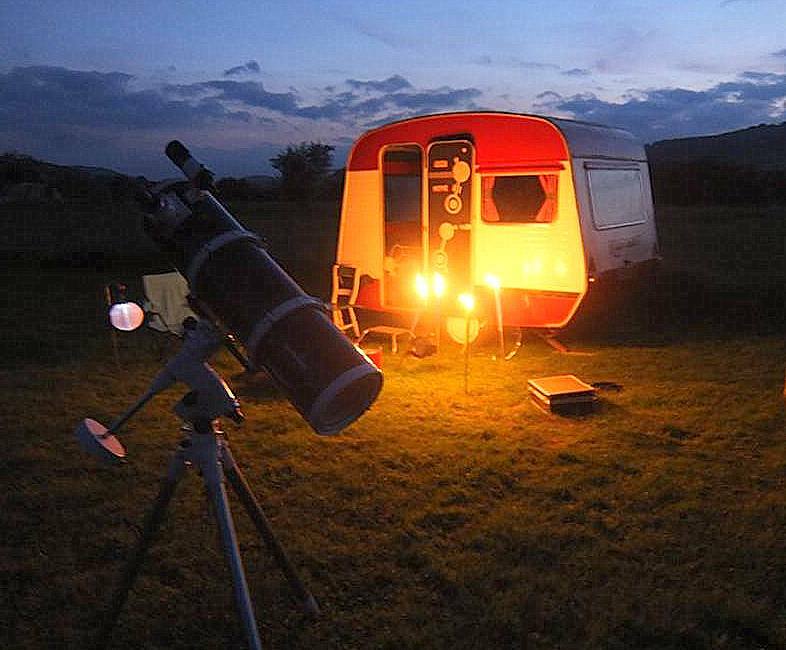 If you want more information on what is visible, or you want it for an observing location other than Wolverhampton, why not look at our Links page which has details of useful resources, such as Stellarium, the free planetarium software. After a very cloudy 2016 winter, we’ve at last been afforded a handful of clear skies for the first few months of 2017. 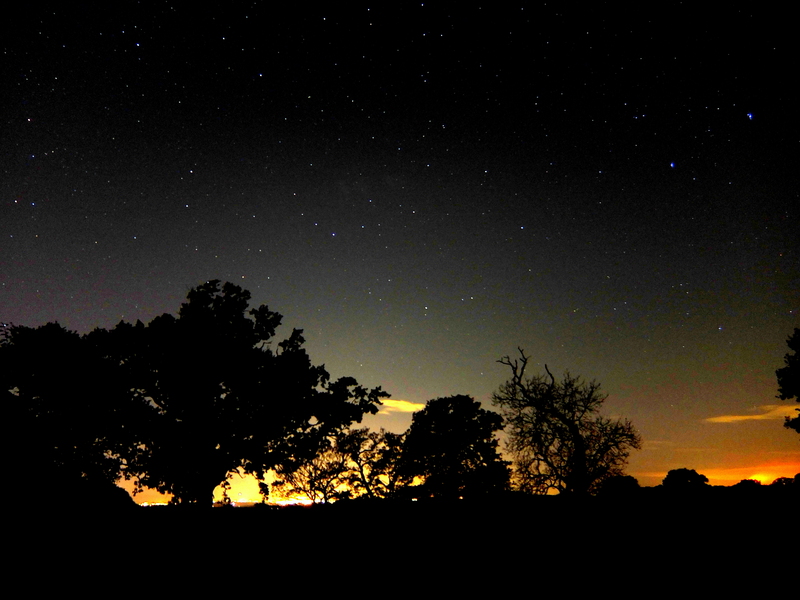 For some reason, Wednesdays seem to be the night we’ve had the most clear skies, with the weekends typically clouded over. 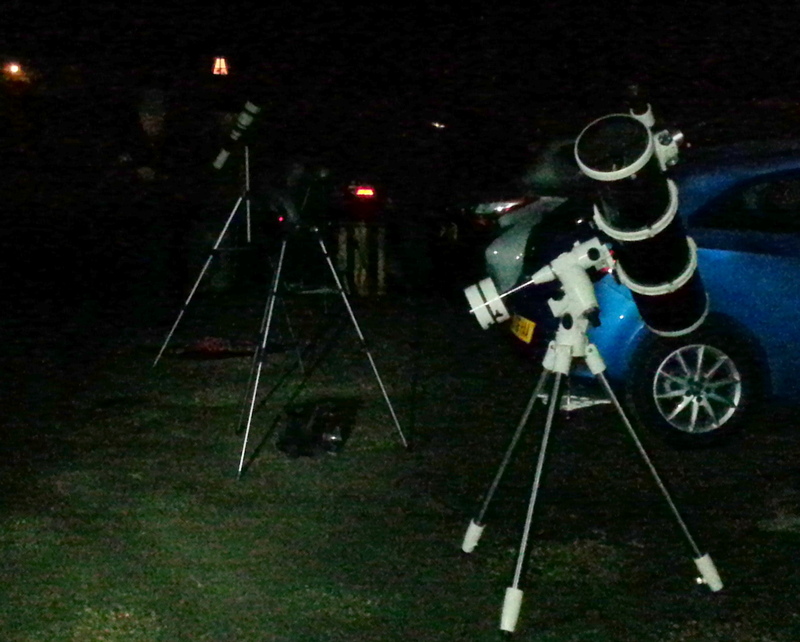 This is most irritating for those for astronomers with 9-5 weekday jobs, it seems we’re always at the whims of nature! Venus has been putting on a superb show in the early evening sky, rising very high through February, and presently, (I’m writing this on 17th March), is heading lower in the Western sky. 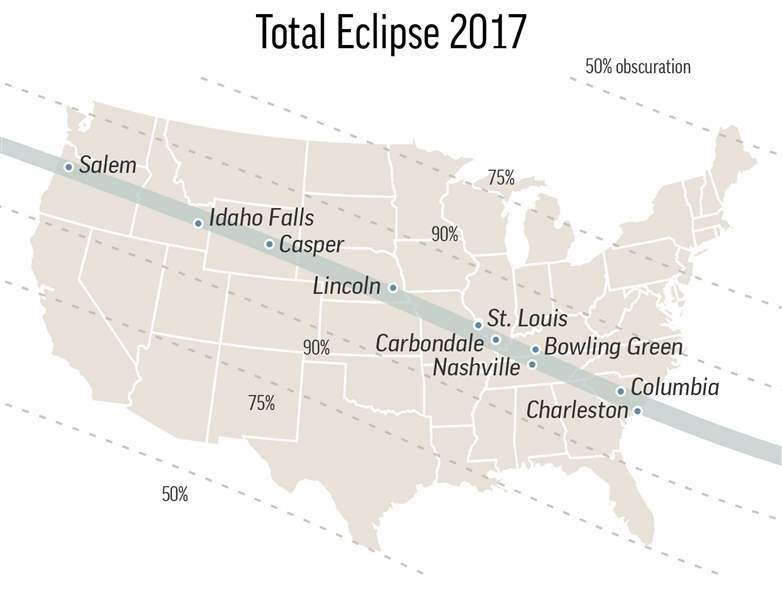 When it’s so visible, most amateur astronomers often get friends asking “what was that bright star I saw last night?” I’ve been asked several times over the past couple of months. 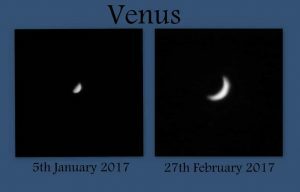 I took some photos of Venus through my 8” Skywatcher in January and February, and was pleased to be able to capture the both the changes in the apparent size and phases of the planet, as it gets nearer to us on its journey round the sun, (photo 1). On the 5th January it was approx 111,000,000 km away from the Earth, and on 26th February approx 54,000,000km away. It always fascinates me that Mercury and the Venus are the only planets that show Moon-like ‘phases’, being closer to the Sun than us. It is well known that only two planets, Mercury and Venus, transit the Sun, as viewed from Earth because they are the two whose orbits around the Sun lie inside that of the Earth. 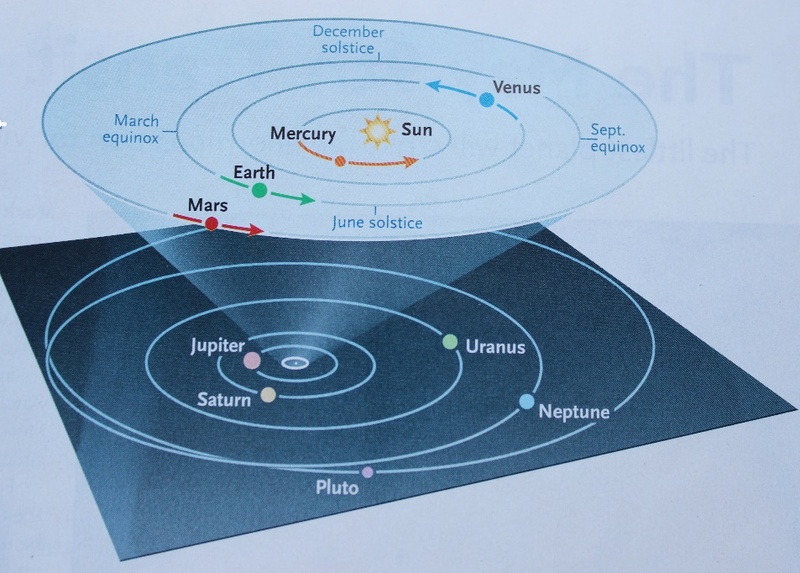 This is clearly shown in the diagram (Image credit to Sky & Telescope) which shows the orbits of the planets and each of their movements during May 2016. The positions of the outer planets do not change significantly on this scale. This was the second transit of Mercury that I have observed and attempted to photograph. My first attempt was on 2003 May 7th and was previously reported in Lyra. The transit of 2006 November 8th was not visible from the U.K.
An example of what can be achieved with the society’s Coronado PST.